Current beach testing results for water safety at all Wisconsin beaches including Atwater, Klode and Tietjen (Doctor's) Parks is available at www.wibeaches.us. What is beach water testing? In order to alert the public about potentially unhealthy water conditions at Great Lakes beaches the health department will post swim advisories based on lab results. Water testing is done at least twice weekly. Lab results indicate levels of E.coli bacteria in nearshore water. 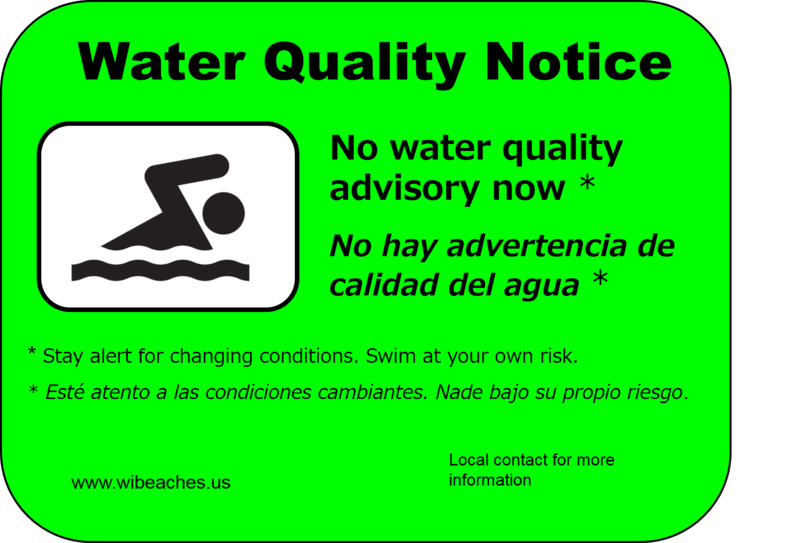 Levels considered satisfactory will cause the beach to be “Open” while levels higher than guidelines require either a swim advisory, a “Caution”, or a closure. Bacteria levels can fluctuate over several hours and since the testing is looking at a specific point in time, those results may not be reflective of present bacteria levels. When considering using the beach, look at these factors: the most recent beach advisory, the weather in the last 48 hours (wind, rain), the clarity of the water, the presence of birds on the beach. So if the beach is listed as open, there hasn’t been heavy rain with winds, the water is clear, and there aren’t a lot of birds ( and subsequent bird droppings) on the beach, you can use the beach. But keep in mind the following: no matter what the posted sign says, never put lake water in your mouth: it is not drinking water. Wash your hands before handling or eating foods. Take a soap shower when you return to your home. So where do I find the testing results? Risk of illness from micro-organism exposure considered minimal. You should still take precautions such as: not ingesting lake water, being aware of other safety hazards associated with swimming, and--as always--swimming at your own risk. Risks of illness due to micro-organism exposure are somewhat elevated. Take the following precautions when the yellow placard is up: do not ingest lake water, wash hands before eating, and shower when done swimming. 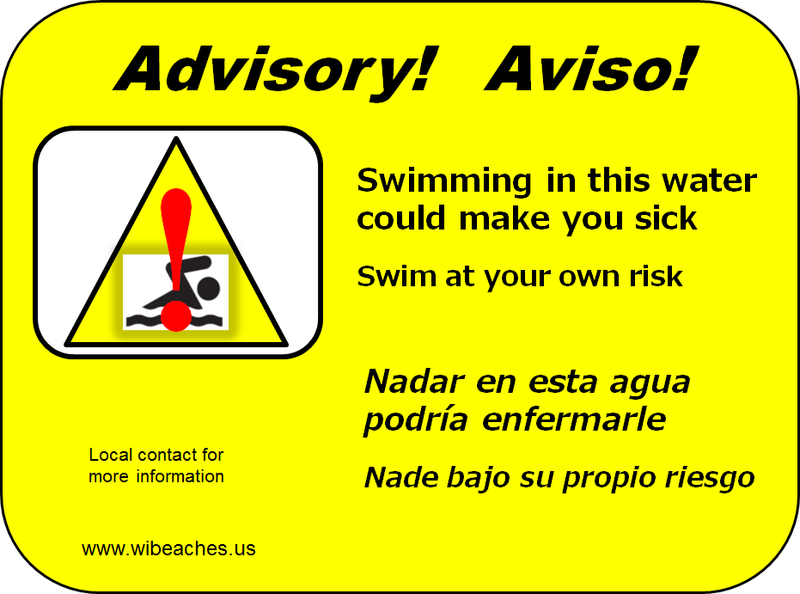 Be aware of other safety hazards associated with swimming, and--as always--swim at your own risk. There is an elevated risk of illness due to exposure to micro-organisms. Do not enter the water. The National Weather Service issues a detailed forecast and weather conditions expected at beaches along Lake Michigan from Sheboygan county south to Kenosha county for the coming day. An extended outlook for the following three days is also included. An updated Recreational Beach Forecast is issued around 5 pm for expected conditions at Lake Michigan beaches for the following day. 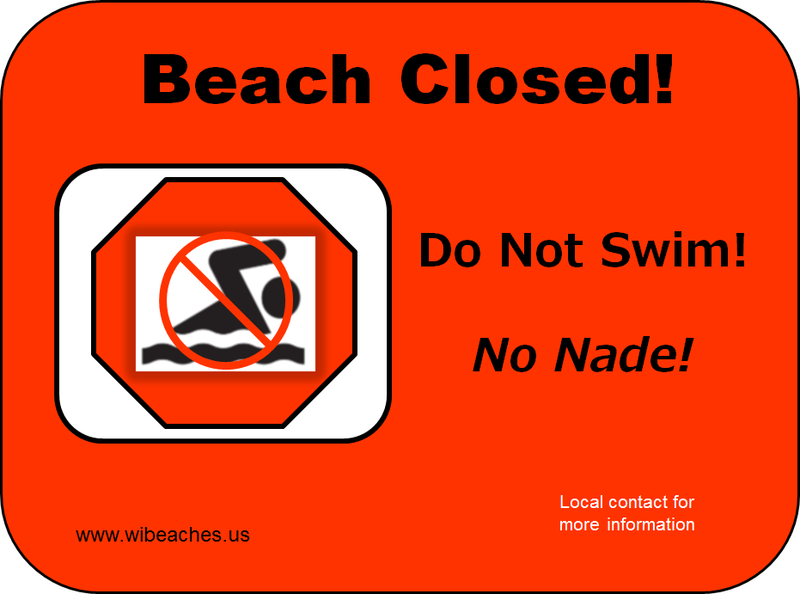 The National Weather Service issues a "Beach Hazard Statement" to increase the public’s awareness about the life-threatening swimming conditions expected that day and/or the following day at Lake Michigan beaches. Prior to swimming at any of the beaches in the North Shore, it is important to consult https://www.weather.gov/greatlakes/beachhazards for information on the weather and temperature conditions to determine current risks for swimming.